Fear and hookworms | Be Nice. Did I tell you I work a boring job? It’s good, don’t get me wrong. Benefits, decent pay for a recession. But it’s dull. Data entry. Is that all I have to say? I think so. While I’m staring into my computer for those 40 weekly hours, I listen to my IPod and try not to think about the irreparable damage I’m doing to my eardrums. Recently I’ve become a huge fan of podcasts, and today listened for the first time to WNYC – Radiolab. On September 25, 2009 they did a segment on parasites (link to their page is here). I didn’t think I would like the subject, but ended up totally fascinated. Particularly I was interested in the story of Jasper Lawrence who suffered from ridiculous allergies which progressively worsened. Jasper tried everything it seemed, until he learned about the beneficial effects hookworms could have on illnesses like his. Determined to alleviate his pain, Jasper exposed his body to quite possibly the most disgusting environment imaginable so he could contract a healthy dose of hookworms. I won’t go into further detail–you can listen to the (free) podcast if you want to hear it! But within less than a year, Jasper went from allergy-attack victim (to the point of hospitalization), to nearly allergy-free! 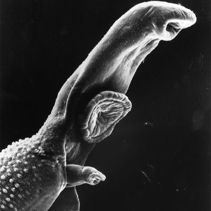 The theory behind this “Helminthic Therapy” is that these little critters evolved with us, living in our digestive tracts where they could sustain themselves, and in turn offer us a little balance down there. But then we went and got all clean. You know: sanitation systems, clean water, bathing more than once every few weeks; and we ended our relationship with the sweet little parasite. Of course, back then it wasn’t so sweet–too much of them caused anemia, fatigue, malnourishment, and other issues. But what scientists have found is that these tiny guys may be the answer, or a very very effective treatment, to many disorders including Crohn’s disease, ulcerative colitis, allergies, asthma, IBS, lupus, and MS to name a few. The podcast asks, “Why aren’t people knocking down the doors of these treatment organizations to get some help? !” and one of the many reasons is the very old, but ever-new: fear. And that’s what I’m writing about here. How many times has “fear” been the reason we haven’t done something? Something that would make us happy, make us feel better, solve a problem. I’m not just talking about infecting ourselves with hookworms either. Was there ever a person you were attracted to that you didn’t ask out on a date, for fear of being shot down? Or a job you didn’t apply for, because you didn’t know what you would do if you actually got it? There are so many reasons we generate for why we shouldn’t do something, and so few we acknowledge for why we should. And often, when we let fear rule our lives, we continue living in unhappy circumstances, being something we’re not, or being suppressed by some sort of liability (like Jasper’s allergies). 1. Are these fears based in anything tangible and logical? Do they have validity? 2. What are the odds that the “fear” would actually occur? 3. Is it a “safe” risk? 4. Will your actions hurt anyone in the process of being achieved? 5. What is worse: staying where you are now, or taking a risk and going for what makes you afraid? Depending on your answers to these questions, you may be in a good position to make that move that causes you so much anxiety. Sometimes, however, the option isn’t worth the risk. But if I had an immune disorder, I think I’d take the hookworms. This entry was posted in To your environment, To Yourself and tagged Crohn's, health, hookworm, immune disorder, Irritable Bowel Syndrome, Lupus, Multiple Sclerosis, parasite, podcast, Ulcerative Colitis, WNYC Radiolab by Jen. Bookmark the permalink.